Reverse: A Bavarian postilion who is now obsolete blows his final bugle. Inscription on ribbon in his hand 'Privileges'. Legend: "God bless you, good old times." Exergue: April 1, 1920 (B'Hüat' di' - is Bavarian idiom for "bless you"). Created at the unification of the German transport system. 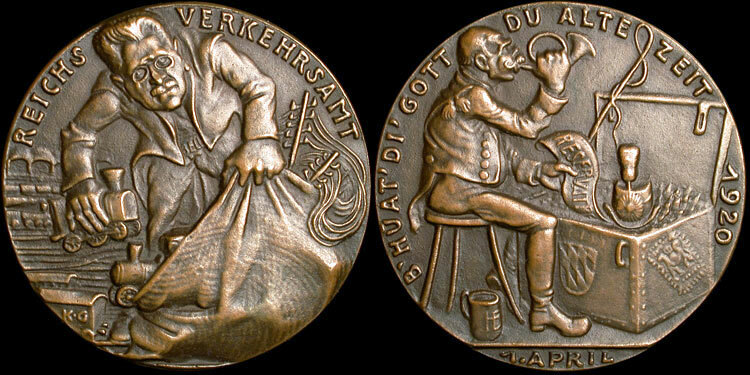 Grade: Gussfrisch (As Cast) A beautiful oversized example with patent Goetz patina.